It’s hard to believe it has been (a little over) a year since I started WhatDidSheFind. Blogging about beauty and fashion is something I’ve always wanted to do, and I’m so glad I finally “took the plunge”. To all of you who take time out of your day to read my posts: thank you. I’m excited to announce that, in honour of my 1 year blogiversary, I’m hosting a giveaway! 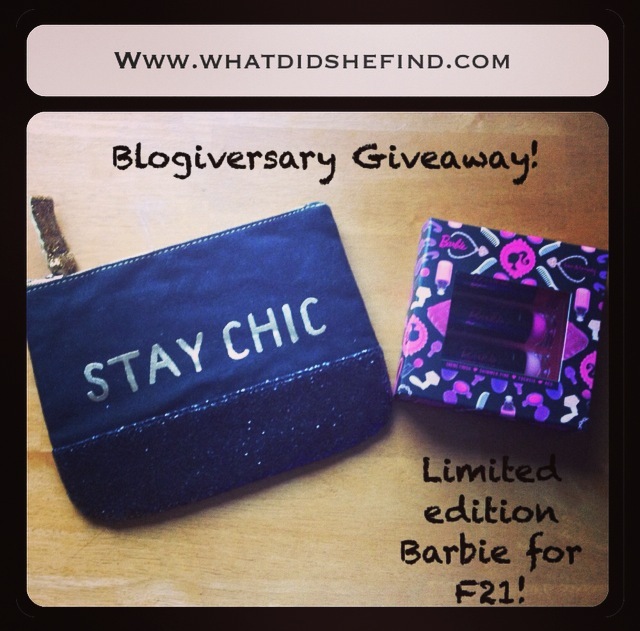 One winner will receive two items I’m currently loving: this adorable “Stay Chic” clutch (or makeup bag), and a limited edition Barbie for Forever 21 lipstick trio (red, fuchsia, and baby pink). Entry requires that the winner be both a follower of my blog and my Instagram account. For extra entries, you can choose to share this giveaway on Facebook. The giveaway is open to residents of Canada and the U.S., and the winner must be 18 years of age or older at the time of entry. Enter the giveaway using the Rafflecopter link below. Here’s to many more fashion and beauty-full years to come!